If your cat is allergic to an ingredient in one of these cat foods, do not try that specific formula with your cat. Remember that you should always avoid feeding your kitty the ingredient he is allergic to. Be sure to read the labels on cat foods carefully. Even limited ingredient diets can contain the ingredients your cat is allergic to. This dry cat food contains one protein source and one carbohydrate source. It does not include any grain, dairy, fish, beef, chicken, eggs, corn, wheat, chickpeas, potato, sweet potato, soy, or artificial colors or preservatives. This food is made with cage-free turkey. Nature’s Variety also makes canned cat food in this specific formula. If your cat eats both wet and dry cat food, you can feed him the same formula if he does well with it. You should be aware that many customers complain that this kibble makes their cat’s poop smell quite foul. The food also has a high-fat content, so it may not be the best choice if your cat is overweight. Nature’s Variety makes two types of kibble in its limited ingredient line. The other kibble formula uses the rabbit as its main protein source. The company also makes five varieties of canned cat food in its limited ingredient line, which include pork, turkey, lamb, duck, and rabbit. All limited ingredient formulas made by Nature’s Variety are Complete and Balanced for all life stages. Contains one source of protein. Fatty acids and antioxidants promote healthy skin, coat, and immune system. May make your cat’s feces especially smelly. The diet has a high-fat content and may not be suitable for overweight cats. This cat food features quality duck as one of its first ingredients and green peas as its main source of digestible carbohydrates. It is made in the United States and contains no grains, artificial colors or flavors, or bleached ingredients.. This food is Complete and Balanced for adult cats. You should be aware that this particular formula contains salmon oil, so it may not be a good choice for your cat if she has seafood allergies. 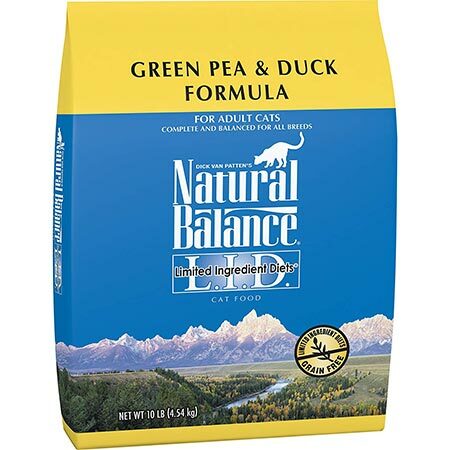 Natural Balance makes four flavors of limited ingredient kibble, including green pea and venison, green pea and salmon, and green pea and chicken. The company also makes the same four flavors in their limited ingredient canned cat food line. Natural Balance even makes three flavors of limited ingredient treats for cats. Features duck as one of the first ingredients. Duck is the sole source of animal protein in this food. Contains omega-3 and omega-6 fatty acids to promote healthy skin and coat. Fortified with vitamins, minerals, and taurine to promote a healthy heart and eyes. This formula contains salmon oil. This formula may not be appropriate for cats with a fish allergy. This cat food is poultry and beef-free. It contains no grains. Instead, the food contains lentils, sweet potatoes, and chickpeas as carbohydrates. 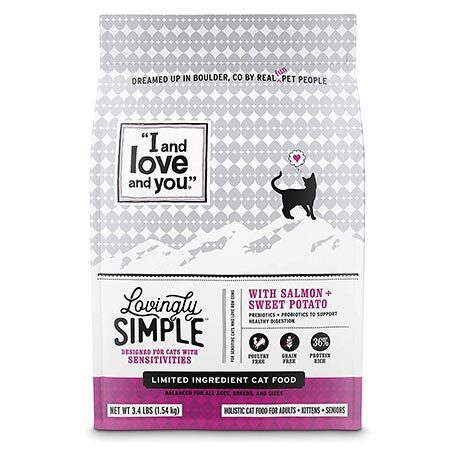 Additionally, I and Love and You Simple Limited Ingredient Holistic Cat Kibble have no wheat, corn, soy, rice, meat, by-products, or artificial preservatives, colors, or flavors. This dry cat food is 36% protein, with meat as its first two ingredients. The food helps with digestion as it contains both prebiotics and probiotics as well. This food should not be fed to your cat if he has seafood allergies as it contains a lot of fish. Some customers complain that their cats do not like this food, so it may not be the best choice if you have a particularly picky kitty. Salmon is the first ingredient. Contains no chicken or beef. Contains prebiotics and probiotics to promote a healthy digestive system. Has fatty acids to promote healthy skin and coat. Is not appropriate for cats with a fish allergy. This canned cat food contains a single source of protein. Deboned chicken is the food’s first ingredient. 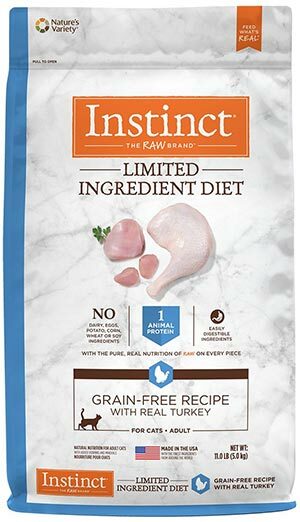 Merrick Limited Ingredient Diet Grain-Free Chicken Canned Cat Food contains no wheat, soy, corn, or artificial flavors, colors, or preservatives. It has antioxidants and omega-3 fatty acids to support a healthy immune system and healthy skin and fur. It should be noted that this particular formula of canned cat food contains dried egg product, so you should not feed it to your kitty is she is allergic to eggs. Some customers complain about the gravy to food ratio in this canned food, claiming there is much more gravy than food in each can. There are three dry cat food formulas in the Merrick limited ingredient line featuring chicken, turkey, or salmon as the primary source of protein. 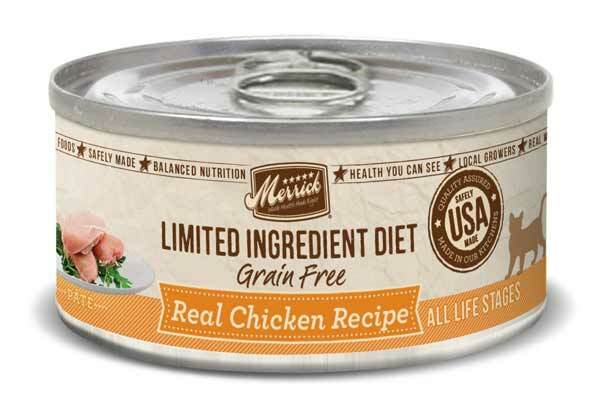 Merrick also makes four flavors of canned cat food in the limited ingredient line featuring chicken, turkey, salmon, or duck as the main source of protein. Chicken is the sole source of animal protein in this formula. Contains fatty acids for healthy skin and coat and antioxidants for a healthy immune system. Is not appropriate for cats with a chicken allergy. Contains dried egg, so it is not appropriate for cats with an egg allergy. There’s more gravy than food in each can. This canned cat food contains potatoes and peas as easily digestible carbohydrates. Turkey is the first ingredient in this food. Turkey is the single source of animal protein in this particular formula. 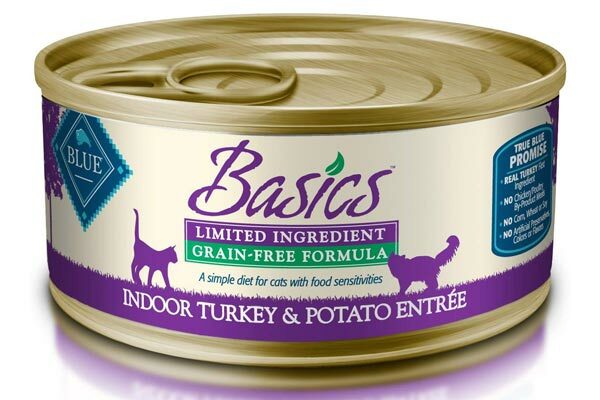 Blue Basics Limited Ingredient Diet Adult Indoor Grain-Free Turkey & Potato canned cat food also contains pumpkin, which supports digestive health in cats. This canned cat food contains no grains, corn, wheat, soy, or chicken or poultry by-product meals. It contains omega-3 and omega-6 fatty acids to support healthy skin and coat and broth to support a healthy urinary tract. It should be noted that this canned cat food contains fish oil, so it is not appropriate for a cat with fish allergies. Blue Basics offers three flavors of dry and wet cat food for adult cats in its limited ingredients line, including turkey and potato, duck and potato, and fish and potato. The limited ingredients line also contains one dry cat food formulated specifically for seniors and one canned food formulated specifically for kittens. Turkey is the first ingredient. Turkey is the sole source of animal protein in this formula. Contains pumpkin to support healthy digestion. Broth supports a healthy urinary tract. May not be appropriate for cats with a fish allergy. According to Cornell University College of Veterinary Medicine, research shows that overall food allergies are the third most common kind of allergy in cats. Food allergies in cats are outranked only by allergies to flea bites and allergies to inhaled substances. A cat can develop food allergies at any age, and a cat can become allergic to ingredients in her diet she’s been eating for years. According to Cummings Veterinary Medical Center at Tufts University, a food allergy occurs when a cat’s immune system identifies an ingredient in the cat’s diet as an invader rather than a food substance. The cat’s body mounts an immune response, resulting in allergic symptoms. Your cat may develop small, pale, fluid-filled lumps or lesions on his skin in response to a food allergy. These lesions typically cause your cat to scratch his skin. The itchy lesions commonly affect the cat’s head and neck, but they can also affect other parts of your cat’s body. 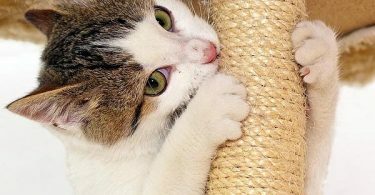 Though the itchy lesions do not pose a significant health problem in and of themselves, the constant scratching your cat does in response to them may lead to secondary skin wounds and bacterial infections. According to Cornell University College of Veterinary Medicine, 10-15% of cats with food allergies also exhibit gastrointestinal symptoms, such as vomiting and diarrhea. Gastrointestinal issues due to food allergies may lead to food avoidance that may result in dangerous weight loss and health problems. What Are the Most Common Food Allergies in Cats? Food additives are often blamed for causing allergies in cats. However, this is rarely the case. According to VetInfo, the most common food allergies in cats include those to seafood, beef, and dairy. Cummings Veterinary Medical Center at Tufts University adds that eggs and chicken are also among the most common food allergies in cats. This YouTube video explains what cat food allergies are as well as how they differ from food sensitivities. It also discusses the most common types of food allergies in cats, how cat food allergies are diagnosed, and how they are treated. Before your cat can be treated for a food allergy, it is important to determine what he is specifically allergic to. If a food allergy is suspected, your veterinarian will have you change your cat’s diet to one that contains a novel protein and carbohydrate source – ingredients your cat has not previously been exposed to, such as rabbit, duck, green peas, and potato. Alternatively, your veterinarian will prescribe your cat a hydrolyzed diet where the protein in the food is broken down into such small pieces that it can effectively hide from your cat’s immune system. While you feed your cat an elimination diet, you must not feed him any other cat food, treats, or people food. It is essential that he eats only his elimination diet during this period. After your cat has eaten his elimination diet for six to 10 weeks, your veterinarian will have you introduce ingredients back into your cat’s diet one at a time until you discover the source of your kitty’s allergy. When you have determined what ingredient your kitty is allergic to, you will need to avoid feeding your cat that ingredient in his diet for the rest of his life to prevent future allergic reactions. When it is suspected that your kitty has a food allergy, a rapid diet change is in order. When you need to make a rapid diet change, PetMD suggests initially offering your kitty a small meal of the new food. If she does not have any stomach issues, offer her another small meal of the new food in a few hours. Continue to offer meals in increasing sizes over longer periods of time until you have reached your cat’s normal feeding schedule again. If your cat initially refuses to eat her meal, pick the food up, and do not offer her anything else. It is okay to let your kitty get a little hungry. Try to offer her the new food again in six to eight hours. If she refuses to eat it again, pick it up, and offer it to her in another six to eight hours. Continue this process for 24 hours. If your kitty refuses to eat the food within 24 hours, consult your veterinarian for another formula of food to try with your cat. You should also consult your vet if your cat has stomach problems after eating her new food. It is best to consult with your veterinarian about the food you feed your cat. Cats are obligate carnivores, which means they must eat meat in order to survive. You want to make sure that the first ingredient in your cat’s food is meat. You will also want to make sure the food you choose to feed your cat has taurine in it. Taurine is an essential amino acid your cat cannot make and, therefore, he must get from his diet. Though cats do not need carbohydrates, most pet food companies use them as fillers. Limited ingredient diets are good for kitties with food allergies because they typically only have a few ingredients and contain all the vitamins, minerals, and nutrients your cat needs. 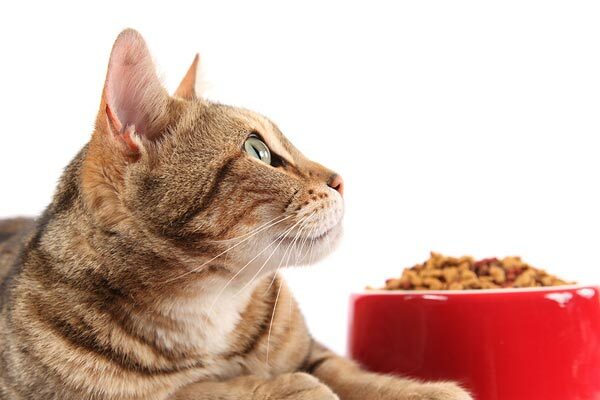 Ensure whatever food you decide to feed your kitty meets the American Association of Feed Control Officials (AAFCO’s) requirements for, “Complete and Balanced.” Foods that meet this requirement will say so on the label. Spruce Pets suggests avoiding certain ingredients in your cat’s food. They suggest avoiding by-products, meat and bone meal, animal digest, and added sugars. They also recommend avoiding chemical preservatives, such as BHT, BHA, propyl gallate, and ethoxyquin. Cornmeal should be avoided as a filler. If you suspect your cat has food allergies, take him to your veterinarian. Your vet will help you determine if food allergies are a likely cause of your cat’s symptoms. If food allergies are likely, your vet will help you get your cat on an elimination diet and help you determine what, if anything, your kitty is allergic to. Once you have a confirmed diagnosis of food allergies for your cat, you will need to avoid feeding him whatever he is allergic to in his diet. Limited ingredient diets are good for cats with food allergies because they expose kitties to fewer ingredients that could cause issues. Consult your veterinarian about trying one of the limited ingredient diets for cats discussed in this article as a way to treat your cat’s allergies.